i will. not sure if this is eating "well" (who came up with that idea anyway), but this is a great after work snack: bhujia with spicy hibiscus ginger iced tea. bell peppers, carrots, jicama, snap peas, tomato, spinach, guacamole, hummus. beat greens, squash, potato, corn, onion, garlic, chili, cilantro. white mulberry: exotic. invasive. delicious. savory breakfast is all over more better. i actually didn't make this one, but i think it's potato, jalapeño, cilantro, flour and water. with chutney and garlic pickle on the side. 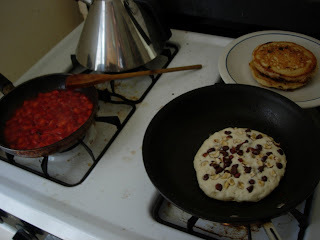 my friend and i are very excited about these pancakes made with soy milk, no eggs, hazelnuts, bittersweet chocolate chips, and syrup from fresh strawberries.